Amped Wireless is a company with a very accurate name: making your wireless world more powerful. Amped Wireless offers many different Wi-Fi related products from antennas, Wi-Fi cameras, Powerline adapters, routers, access points and so on. What we are looking at today is a Range Extender. What this does, is essentially repeats your Wi-Fi signal, but with greater strength, giving your Wi-Fi much better range. Some might say that something like this isn’t needed, as you should just buy a better router. In this day and age of tyrannical, monopolized internet providers, sometimes you don’t have a choice, or at least not a palatable one, but to use their sub standard gear. 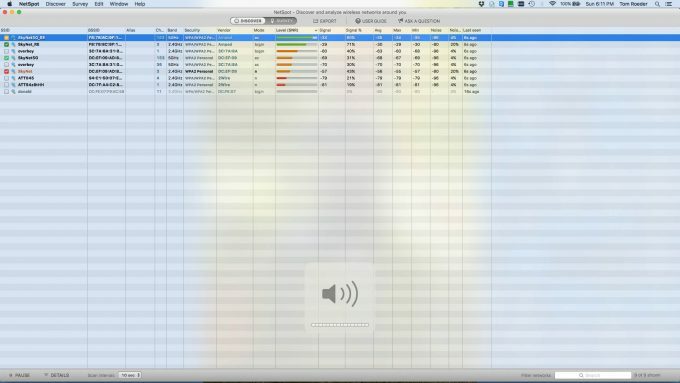 I have had a Comcast Wi-Fi router, and it was a miserable experience. But how exactly do these range extenders work you might ask? As I brushed on before, they essentially repeat your Wi-Fi signal. 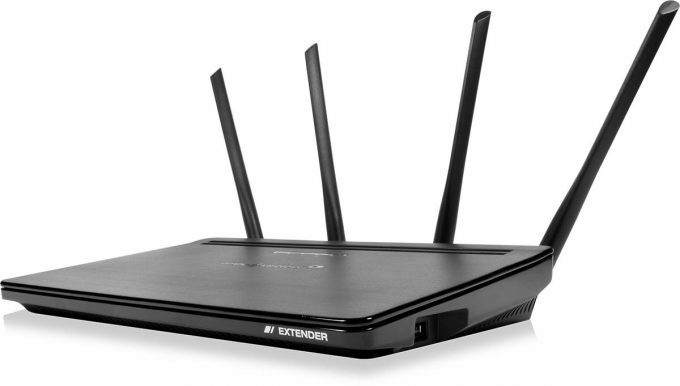 The Extender pairs with your existing router or access point, you give the Extender the Wi-Fi credentials, and it takes your existing Wi-Fi signal, amplifies it significantly, and thanks to the high gain antennas, greatly improves your Wi-Fi range. But it’s not just antennas and raw power that make this possible. 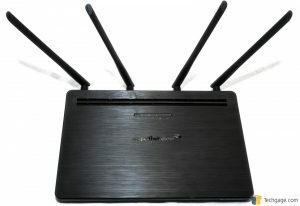 The ATHENA-EX packs a dual-core processor, 128MB of DDR3 RAM, 16 high power amplifiers, 4 high gain antennas, not to mention intelligent firmware with MU-MIMO technology, which enables multiple devices to receive and transmit data all at once, ensuring uninterrupted streaming for all devices in your house. To give you a little perspective, your standard range extender put out about 50mW of power, whereas the ATHENA-EX boasts up to 800mW, which Amped Wireless claims will allow this extender to have an effective range of up to 15,000 square feet. 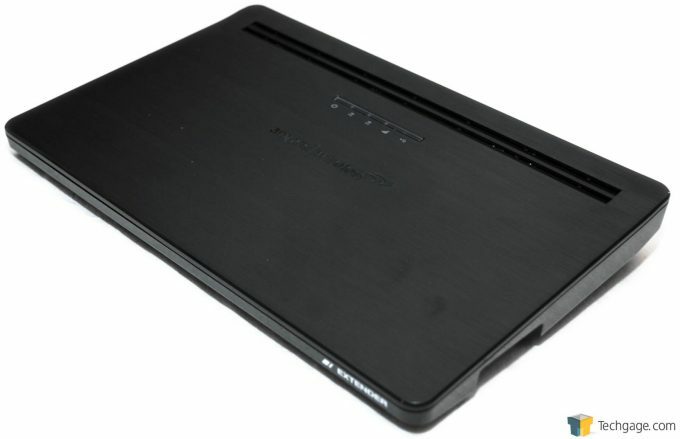 This particular model, the Amped Wireless ATHENA-EX, offers both 2.4Ghz and 5Ghz networks. 2.4Ghz offers better range for your devices, and is the more common type used in public Wi-Fi hotspots. 5Ghz doesn’t have quite the range the 2.4Ghz does, but the performance on 5Ghz is much better for bandwidth-heavy applications. A range extender is one of those things you aren’t going to set as a visual focal point in your décor if you take my meaning. The aesthetic of this range extender is muted, sleek, and modern. The top of the unit is a brushed, flat black finish, with the logo in the middle, and indicator LEDs above that. 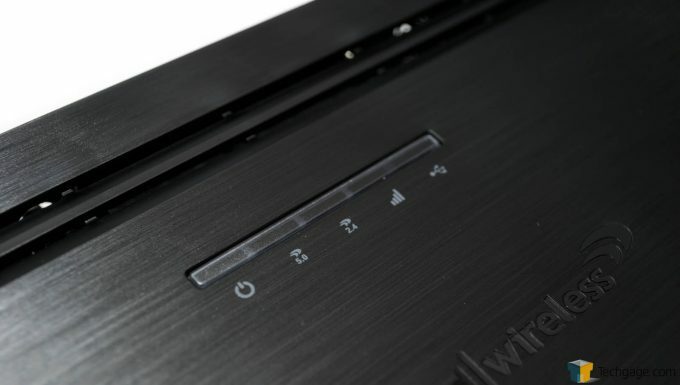 On the back of the ATHENA-EX, we see a total of 4 antenna ports, a power button, a standard barrel connector power input, USB 2.0, (a USB 3.0 port is on the side) 4 ethernet ports, a button to toggle the LEDs on or off, WPS (for easy setup and pairing), and a hard reset button. 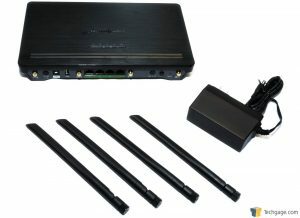 The unit comes with 4 high gain antennas, a wall wart power supply, and a quick start guide, and a DVD for setup and installation. First things first – get this thing physically setup. The ideal location will vary greatly from my application to yours. The quick-start guide has some recommendations on things to consider, and some suggestions on where/how to place your range extender. Part of this staging of where to put your extender will depend on your Wi-Fi strength in your home, luckily Amped Wireless included a free download for a Wi-Fi analyzer. Unfortunately for me, this is only offered for Windows or Android. I only own an NVIDIA Shield Portable (inappropriate for this testing) and my Windows machines are all hard wired. Luckily I have my own Wi-Fi software that works well. The Amped Wireless ATHENA-EX comes with a DVD-ROM, but who has those clunky drives anymore? Luckily, it came with a quick-start guide that got me to the web interface to get this thing going. The instructions give you a DNS name to login to the extender with, once you are connected to one of its unsecured networks. The DNS never did resolve for me, no big deal, as they give you a IP address as well to enter, smooth sailing so far. The next step once logged into the UI, is to connect to your home router. To do this, simply click on the green button labeled “Scan”. This quickly found all of the Wi-Fi networks around me (many of which I had not seen before), so I selected my network for 5Ghz and 2.4 respectively. Next step is to enter your password, or network key, for both networks, if you chose to select both networks. You don’t have to, if your router only has one, just pick whichever one you have and drive on. This begins the bonding process, and as long as all your credentials are right, the ATHENA-EX should be paired to your router. Next step was to give the extended networks names, but you can leave these the default if you choose, and also set passwords for both. You can choose to clone the settings for the two networks, and the router will name the connections based on your existing network’s names, and clone the passwords for each. When you are done with this, the extender applies the changes and reboots. From here on out, you are more or less done, the ATHENA-EX is configured and ready to go. The UI is feature rich, from configuring guest networks, adjusting power output, even configuring shared storage from the USB 2.0 or 3.0 ports on the router. If your router is a dual band router, you can take advantage of the BOOSTBAND technology, which increases throughput and performance for your connection. There are also settings for port forwarding on the wired connections, which brings me to a great feature this extender has, wired connections. What the wired connections offer is, up to 4 gigabit Ethernet connections. For example, if you have something that is wired only, or something you need a lot of performance for, you can just plug it into the extender, and you are instantly hard wired, no configuration, no nothing, it just works. I put this Amped Wireless ATHENA-EX through the gauntlet, I really did. My home internet provider is The Devil, er uh, Comcast I mean, and I have a pretty steady 125Mbps download, and 25Mbps upload. The first testing I did was basic wireless connectivity. I have an iPhone 6s Plus, and my wife has an iPhone 6. I forced the phones to forget our home networks, and only allowed them to use the ATHENA-EX exclusively. This also rang true for my wife’s Macbook Air, my Macbook Pro, and my son’s iPad 4th gen, a Roku 2, Roku 3, and a Amazon Fire Stick. Connectivity was excellent, there was never any hunting or searching for service, and the devices all connected immediately, just as they do with my main router, which is a Netgear R6400. Since we all know connectivity isn’t everything, I load tested this extender, a lot. I not only performed various speed tests, but also many heavy data transfers, solely over Wi-Fi through this extender. This ATHENA-EX took everything I could throw at it. I even hooked up my main rig wired to it, and really put the screws to it, and its performance never dipped. I work in IT, so I am always checking my home network and performing maintenance, so I know pretty much what to expect at all times performance wise, and I noticed that any weak spots I had in my house were a thing of the past. And no matter how good your Extender is, it will only be as good as the router or access point you are pairing it to, luckily my router performs fantastically. I performed many speed tests and received very consistent results. The places out in my yard, towards the edge of my property where my signal was choppy? A thing of that past, for sure. I have lived in my house long enough to know where all my bad spots were for Wi-Fi, and I now have full signal, or close to it, everywhere I need it. Now of course, your mileage may vary. You will need to conduct some testing, and really give your ATHENA-EX placement some thoughtful consideration. But one thing I know for sure, this WILL drastically improve your Wi-Fi coverage, and do it very, very well.